Tom Wheatstone and his delivery horse, Lady, in the days when he worked for T. S. Matthews at Bartonsham Farm. Herefordshire’s leading dairy started out almost 150 years ago with one cow and a wheelbarrow. Back in 1833, Herefordian Edwin Matthews emigrated to America and started work as a steam engine driver. The outbreak of Civil War put paid to his career and he returned home, working as a train driver on the Cardiff to Liverpool line. But when he was injured in an accident near Kilpeck he left the railways and started a dairy milk business. The dairy passed onto John’s grandfather, John William Matthews, who ran the business until 1948. “In the early twenties grandfather had taken the tenancy of the little 120 acre Bartonsham Farm, just by the bend of the river, from the Church Commissioners. “John William Matthews also moved from Whitecross to the back of the Booth Hall where they set up a milk shop. My father, Thomas ‘Stan’, and his two brothers were born there. “Father joined the RAF in the war, flying Liberators, Lancaster and Wellingtons, and when he came back in 1946 he took over the farm milking 70 or 80 cows by hand. We had a parlour at Bartonsham and Dad had half a dozen people, Land Girls at first then later men, sitting on milking stools at six o clock in the morning to milk all these cows. Then they’d clean them all out: the cows didn’t go out in winter - they were cosseted those cows! "We’d always had mostly Friesian. Dad kept a ‘flying herd’, buying his cattle from Hereford Market when they were freshly calved and full of milk. Every Friday he would go to town and buy a few cows. Every Thursday he’d sell a few fat cows. For a period of weeks, they’d be dry, building up their reserves for their calf. Then they’d be milking again. When the cattle finished their milking life they were sold back at Hereford Market for meat. Bartonsham Dairies grew. In 1961 a pasturiser was installed and several dairies started bringing their milk to be pasteurised at Bartonsham. Gradually, however, the 30 or so dairy farms supplying milk to the city slipped away. John’s son Paul joined the business and by 2000 they were running four milking herds, buying in milk from another six or seven farms and delivering milk as far west as the Welsh Valleys and north up to Church Stretton. There were other dairies nearby: Mrs. L. Boughton remembered the St. James Dairy, its entrance on St. James Terrace, which was run in the 1930s by a Mr. Preece. Before it was developed into Hereford's biggest housing estate, the Newton farm was managed by twins, Derek and Ken Powell. The farm’s 450 acres here and at Redhill not only supported 200 sheep and crops of wheat, barley, sugar beet, potatoes and cider apples, they were also home to a herd of 100 dairy Shorthorns. 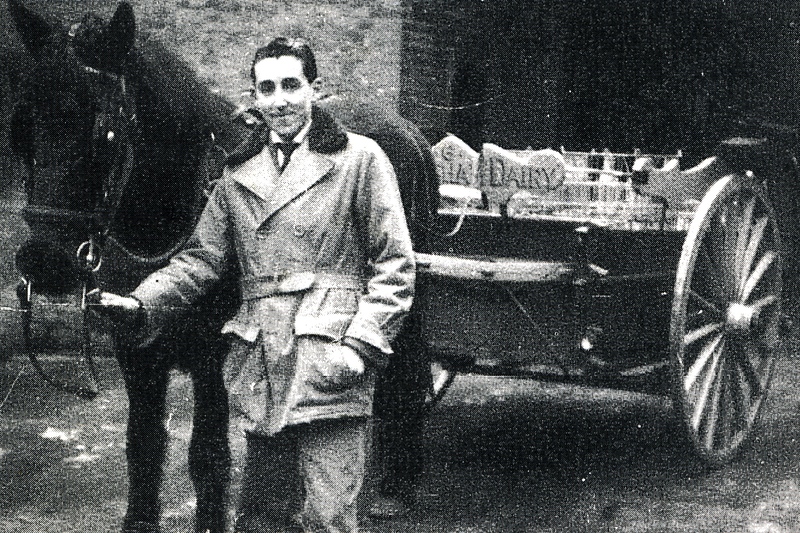 The milk was delivered daily by horse and trap to the Devon Creamery in Whitehorse Street. The Maypole Dairy Shop was in High Town. Will you stamp the cow on the marg? We are having some posh friends for supper. Dorothy Morris was a land girl at Bartonsham Dairy during World War 2, writes Faith Ford. She had joined the Women’s Land Army when her parents moved into St James and she lived at home while working on the farm. She delivered milk in Park Street, Harold Street and Green Street, and later she changed to St Owen’s Street, Bath Street, Kyrle Street and ended up at the police station where she delivered milk according to the number of prisoners (half a pint per day was allowed). She made friends with two other Land Army girls, Muriel Hodgkinson and Joyce Wilkinson. Muriel came to Hereford from Sheffield in 1941, being billeted with Mrs Tout in Green Street who was widowed in 1942. She had a daughter, Gwen, who worked at Thynnes Tile factory, and a son, Bernard, who was in the RAF and spent his war in India. Muriel learned to milk by hand and drive a horse and float. Her round was High Town and she recalled the army and RAF vehicles that made driving quite hard. Her round included the Odeon cinema, shops and cafes and she delivered milk to the Dean’s wife. At that time the Deanery was used as a billet for some of the Yorks and Lancs regiment and it was here she met her future husband, Frank, who was in the regiment. They were married after he was involved in the D Day landings in October 1946, Muriel having left the farm in May 1946. Muriel later moved to Skipton. Joyce Wilkinson came to Hereford in 1942. Her milk round was as far as Whitecross. She was engaged to Bill who was also in the RAF in India, and was demobbed in August 1945 when her husband returned from the war, and they married in October 1945. She moved to live in Sheffield.